WizKids is happy to announce the launch of D&D Attack Wing. Even if I get nothing else, I want the blue dragon. WizKids Games, the industry leader in quality pre-painted collectible miniatures, is pleased to announce the release of their much-anticipated D&D Attack Wing™ Starter Set. 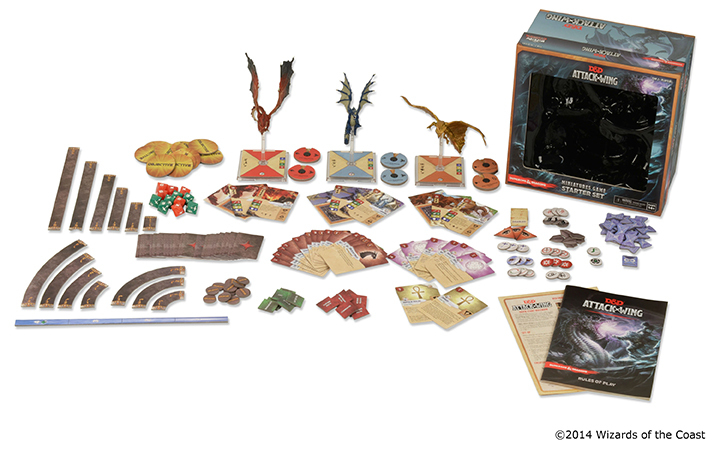 D&D Attack Wing is Dungeons & Dragons themed, and brings the heroes, villains, and monsters of the D&D universe to life in fierce miniatures combat. Along with the D&D Attack Wing Starter Set, seven expansions are also available at launch to help players dominate the skies in ferocious aerial duels!